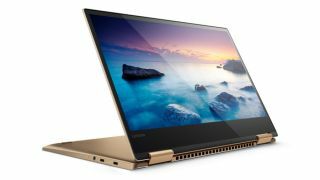 According to the notebook rumor mill, Lenovo is set to launch the Yoga 720 at MWC (which kicks off at the end of this month), with a pair of new variants boasting Kaby Lake processors and an option on powerful GeForce GTX 1050 graphics (in the case of the larger laptop). The source of this leak, Notebook Italia, claims that this successor to the Yoga 710 will come in two flavors – 13.3-inch and 15.6-inch convertibles which will maintain much the same design, except they’ll be a bit thinner, and with slimmed-down screen bezels, as well. Starting with the alleged 13.3-inch offering, this will have a Full HD display powered by up to an Intel Core i5-7200U processor (seventh-generation Kaby Lake), backed with 8-16GB of DDR4 system memory (2133MHz) depending on the exact configuration. On the storage front, either a 256GB or 512GB SSD will be present. Why wait when you can opt for the all-new MacBook Pro right now? The 15.6-inch convertible will be the same as the above, except it will push the processor ante up to a Core i7-7700HQ, and it’ll have a larger battery – along with the option of a discrete GPU in the form of a GTX 1050 with 2GB of video RAM. A fingerprint reader will be added on the security front, and there will be an option on a backlit keyboard, too. Connectivity will include 2x2 802.11ac Wi-Fi plus Bluetooth 4.1, and physical ports will reportedly comprise of a USB Type-C connector, two USB 3.1 ports and a pair of USB 3.0, as well (although there will only be one of the latter in the 13.3-inch notebook). Available colors are set to be platinum silver, iron grey and rose gold (although the latter will only be an option for the smaller hybrid). As ever, remember this is only a rumor, but with all the images and details grabbed by the source, it seems a pretty convincing one. We’ll know for sure in just a few weeks’ time, anyway. Earlier this week, Lenovo announced the new Yoga A12, which is a 12-inch variant of the Yoga Book with a very tempting price.